Space travel has always captivated the human imagination. 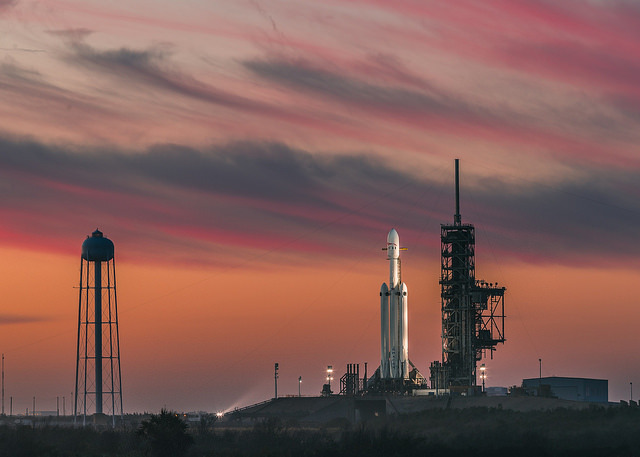 I think that the recent Space X launch of the Falcon Heavy was a significant milestone for our species. However, I think that these events have a much larger impact on the consciousness of the planet. When the Apollo astronauts landed on the Moon there was something quite immense about seeing space and then looking back at our own beautiful Garden of Eden. What I liked about the recent event was launching the Roadster in to space ‘driven’ by Starman with the David Bowie song “Space Oddity” being played. You can see the ongoing live video below. Apparently David Bowie wrote the song after watching 2001 Space Odyssey by Stanley Kubrick. The significance of this cannot be overstated, even if it wasn’t fully intentional by Musk himself. In an era where many of us are negative about human beings, this put human ingenuity back at the centre of everything. I sometimes meet technologists and those religiously-fervent fans of the Singularity who cannot wait to replace human beings. The newspapers warn the masses that they are merely outdated biological machines and they will soon be replaced by AI and robots. And some of us even think, ‘well we’ve been so bad to the environment, to each other etc etc. we probably deserve to go extinct.’ I remember a surreal conversation I had with someone at a bastion of ecological thinking in the UK (Schumacher College) last year where she was enraged that I was positive about humanity’s innate goodness and my optimism for the future. She was literally screaming at me on the lunch hall. Perhaps she was part of the Voluntary Human Extinction Movement! I’ve have never heard of people getting well through self-hatred. I should imagine that this rule of thumb works at the level of the collective as well. Here is a live feed of Starman for a bit of fun. Wise sages, like the Indian Krishnamurti, have said whats the use of our supersonic jets and other technologies, if we cannot even have peace in our families. I think there is a lot of wisdom there. We must continue to look inside and self-reflect, and I believe that this is happening. But what I have realised is that the inner and outer journey are interlinked. In my own life it was necessary to travel the world, to live in far off lands and adventure, to learn things that perhaps were accessible to me at home. Furthermore, I have come to believe is that the nature vs human division is wrong. We are part of nature. and this means that our tools and technologies are also part of nature. So on on the surface it looks like we are causing immense damage to the environment today,what if humanity is just at one stage of its evolutionary development? We don’t know whats next. Besides, many great scientists, including James Lovelock, has said that it would be difficult for us to kill off this entire planet. Even if we launched our entire nuclear arsenal, it would probably just result in our own demise. Life has a very tenacious and beautiful way of continuing and expanding. My mind was blown recently watching how life started on the Hawaiian islands after molten lava first appeared in the Pacific. Many of us extrapolate existing trends in a linear fashion and assume that environmental degradation will continue as its been, but when peoples’ minds shift, then patterns can change abruptly. The real world is non-linear and I think that we are shifting into a new era of human consciousness. Today I think we are in the midst of immense change for our species. As Emerging Future has been anticipating and documenting, the institutions we set up 300 years ago after the industrial revolution are breaking down. Politics is looking ugly and things are likely to get uglier over the next couple of years. This is a good thing as they no longer represent our newly emerging values or even scientific discoveries. Over time, I think that humans’ ingenuity – with our tools and technologies – will be able to overcome all of the crises we face. Humanity might actually just be at the cusp of its greatness.